Kabul hits with massive bomb blast near Indian embassy. Over 50 people have been killed or wounded in this lethal suicide car bomb attack which held on a Wednesday morning. It is to be said that the explosion has been triggered by a vehicle-borne improvised explosive device (IED) around 50 meters from the Indian mission. All staff members have been moved to strong rooms, sources added. Prime Minister Narendra Modi tweeted “India stands with Afghanistan in fighting all types of terrorism. Forces supporting terrorism need to be defeated”. Recently the Sardar Daud Khan Military Hospital in Kabul, Afghanistan, was attacked by a group of gunmen, some of them dressed in white hospital robes. Government officials confirmed at least 49 people were killed in the hours-long assault, while 63 others were injured. By March 13 the unconfirmed death toll had surpassed 100, with an unknown number injured. The Islamic State claimed to have carried out the attack, but officials suspected the Haqqani network instead. Kabul was exploded with multiple attacks in first three months of 2017. 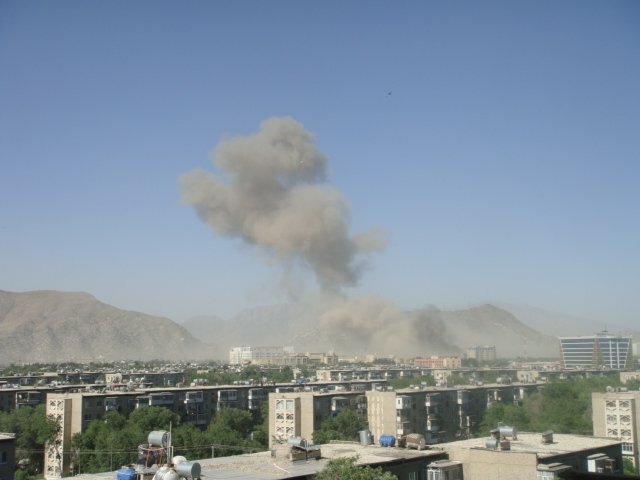 May 3: A car bomb exploded near the US embassy in Kabul, targeting a NATO convoy in which 8 people were killed and over 25 were wounded in the blast, including 3 US troops. ISIS claims responsibility for the attack. May 17: ISIS-K terrorists attacked the Afghan state television building in Jalalabad, the battle lasted for 4 hours leaving at least 6 people killed and 4 terrorists were killed. May 21: A Taliban ambush killed least 20 Afghan policemen and 10 others wounded in Shah Joi district, Zabul province. Also that day, a German aid worker and Afghan guard were killed and a Finnish woman believed kidnapped when gunmen stormed an international guest house in Kabul. May 26: Taliban militants attacked a military base in Shah Wali Kot District, Kandahar province killing at least 15 Afghan soldiers. May 27: A suicide car bombing held in Khost Province in which around 13 people Killed.